2017 In A Sentence: The Bears finished without a win in Ivy League play and finished just 2-8 overall with the two wins coming against the other two Rhode Island Division I schools of Bryant and Rhode Island. Biggest Shoes to Fill: All-Ivy DE Richard Jarvis also earned All-New England and FCS All-Star accolades last year. He led the Brown team with 69 total tackles, seventh best in the Ivy League. He ranked second in the Ivy League in sacks (eight) and tackles for loss (14.0). His 17.5 career quarterback sacks rank second in Brown football history. Key Player: WR Jakob Prall had a break-out season last year with 51 catches for 587 yards, ranking sixth in the Ivy League. He had a big day vs. Harvard with 13 receptions for 120 yards against the Crimson. 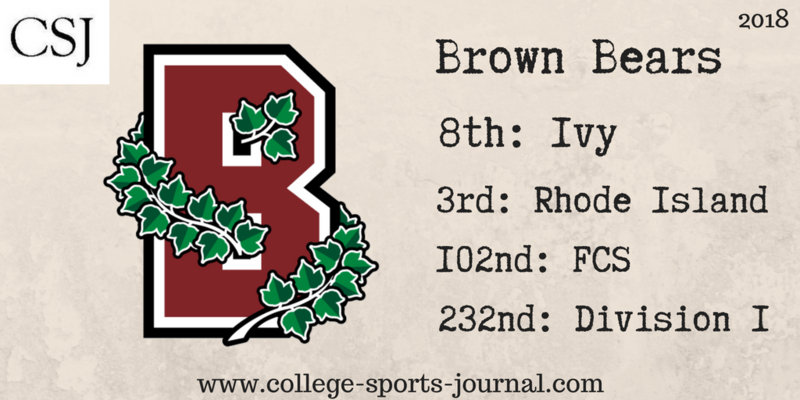 Prall also hauled in seven catches for 103 yards vs. Rhode Island to help Brown capture the Governor’s Cup. Fearless Prediction: With eight starters on offense and five on defense back for the Bears, experience should not be a concern. The one concern area, however, is the quarterback position where at least three contenders are there to take the starter job. If Brown can get production out of the signal caller, it should be able to win at least a couple times in Ivy League play. If not, it is back to the cellar again for this team.